The story begins in 1965 when a newspaper editorial was published discussing the destruction of the American Falls. They believed the destruction would have been caused from previous rock debris that had gone over the Falls. Their claim was that if the erosion of the American Falls continued, it would ultimately lead to the destruction of the Falls. In order to prevent the destruction of the Falls, the International Joint Commission created a board, the American Falls International Board in 1967. After two years of deciding what they should do, the American Falls International Board appointed the job to the Buffalo District. The Albert Elia Construction Company of Niagara Falls, New York was given the contract to complete this task. Their job was to build and, upon completion of the main project, removal of a 183 metre cofferdam. The cofferdam was to stretch from the mainland to the head of Goat Island. The cofferdam would block the water coming towards the Falls so the workers could clear the debris from the top of the Falls. The cofferdam took 3 days of 11 hour shifts and 30 workers to complete. The cofferdam consisted of boulders and fill. It took 1,264 truck loads of fill to stop the flow of water. The fill consisted of 27,800 tons of rock and earth to build the cofferdam. For safety precautions the workers constructed a fence along the brink of the Falls. The American Dry Falls lead to two opportunities, the removal of a body from the foot of the Falls and the rise in tourism. A man was seen jumping into the Falls while the cofferdam was being built, so the police ventured to the foot of the Falls and discovered the body of a woman caught in the rock debris. Visitors from near and far travelled to see this once in a lifetime experience. On one side of the Falls only a trickle of water would flow over the brink, while the Horseshoe Falls were flowing stronger than ever. Since the project was announced, officials planned to allow tourists to walk on the dry river bed, a possible once in a lifetime experience. The main problems are liability in case anyone is hurt and keeping tourists from interfering with workmen. Original plans called for a walkway within ten feet of the brink of the Falls. Over one weekend a total of 89,790 people visited the park near the dry falls. Police ordered spectators and rock collectors off of the dry Niagara River bed during the weekend. Persons walking on the dry river bed, police said are risking injury. Niagara Frontier State Park Police said many people are walking on the dry river bed from time to time and police are hard pressed to get them off. Almost two months after the dam was built, the Niagara Frontier State Park Police allowed people to journey onto the dry area of the river. Problems arise on the Canadian side as the Horseshoe Falls is not drawing the same attention that Dry Falls is getting. Although its billed as bigger and better than ever, the Horseshoe Falls is neither dry nor attracting many visitors or as much attention as its American counterpart. The extra 2 percent in water tumbling over the 2,200 crest can’t compete with the dry American Falls. During daytime hours 92,000 cubic feet of water per second plunges 176 feet drop of the Horseshoe Falls. At night the flow is reduced to 50,000 cubic feet of water per second to allow for hydro diversion. Now the entire 100,000 cubic feet of water per second is flowing over the Horseshoe Falls. While attention focuses on geological studies to determine ways to retard future erosion, the cleaning up of the talus at the base of the American Falls remains problematic. The Horseshoe Falls eroded at even stages at a rate of about 2.2 feet per year. The Horseshoe Falls has never had a major rock slide of the magnitude of those plaguing the American Falls. After four and a half months of working on the American Dry Falls, the cofferdam was removed. Although most people were hoping for a big wave of water to flow down the Falls, the Albert Elia Company were prepared to remove the dam slowly to prevent this from occurring. 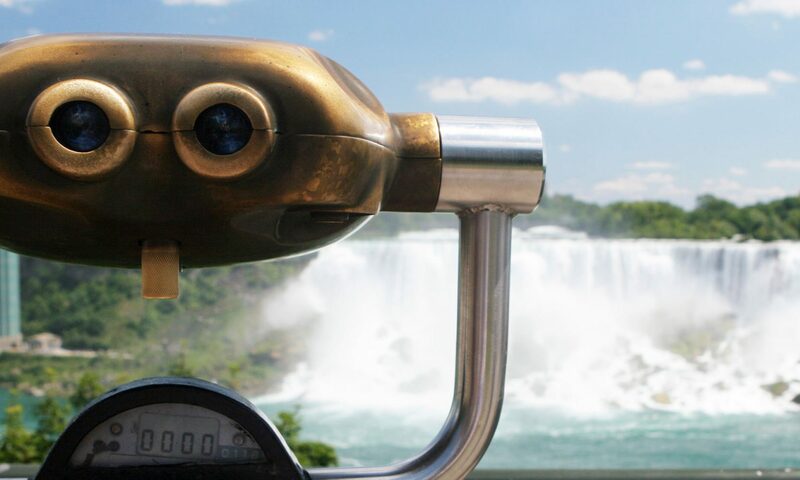 In 1975, the International Joint Commission presented their results, conclusions and recommendations in a report entitled “Preservation and Enhancement of the American Falls at Niagara. These results were made public. The talus at the base of the American Falls is estimated by engineers at 358,000 tons (280,000 cubic yards) with the talus reaching 135 feet (41M) high in places reducing the water fall from 100 feet (30m) to a mere 45 feet (13.7M). The depth of the talus ranges from 25 feet (7.6m) to 50 feet (15m). The talus was accumulated as a result of major rock falls in January 1931, July 1954 and December 1959 which cumulatively deposited approximately 130,000 cubic feet of talus at the base of the American Falls. During the dewatering process, tests included 46 core borings totaling 4,882 feet (1488m). In addition to various mapping and probing processes, piezometers were installed to measure water pressure on rock joints and extensometers to measure rock movements. The public response was overwhelming. Five thousand prepaid cards were returned along with 70,000 other replies. The conclusion of this process was that a majority of respondents chose to not change the American Falls. a statistically minor element of risk from unpredictable rock movement will remain and must be accepted by the viewing public.